This is the most classic offwidth climb in Yosemite. Not only was it one of the first 5.10s, Chuck Pratt led the crux pitch with only three poor pieces of gear. Imagine a 5.13 put up onsight with a potential death fall and you will understand how significant this climb was in the mid-60s when 5.10 was the limit. 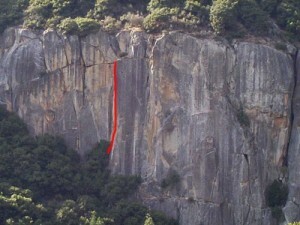 Today few people climb this route because it is just too darn hard. The crux can either be climbed by hand stacking or with wild stem moves. Avoid the last pitch. Which SuperTopo guidebooks include a topo for Twilight Zone?